It seems like Telegraph is popping out new hot spots like octomom  these days. 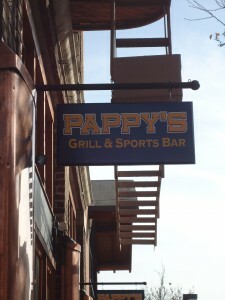 In addition to The Toaster Oven , Pappy’s Grill has opened where the beloved Blake’s  previously stood. Pappy’s carries reasonably priced burgers ($5.99 for a classic) and has some similarity to ESPNzone  restaurants. The joint has 8 big monitors showing various sporting events simultaneously, including a 17.5 foot screen, for a fan-friendly environment. Downstairs, Pappy’s has a bar scene much like the nearby competitor, Kip’s . An anonymous visitor said, “I feel that at Kip’s, people just get up and dance because they’re so drunk whereas Pappy’s actually has dance floor.” Additionally, the bar hopper informed us that Pappy’s was more technologically savvy with their music systems, even displaying screens playing music videos. Another customer chimed in, “Pappy’s is a lot cleaner and less crowded, but Kip’s is a tradition.” They may say Pappy’s is cleaner now, but we know that no place on Telegraph stays that way for long.